Pictou is a picturesque town sitting on the shores of the Northumberland Strait in Nova Scotia. It's 3,800 citizens are fiercely proud of the their community. Pictou was founded in 1767 with the arrival of the "Betsy" from New England. The first settlers were instrumental in clearing the way for the Ship Hector which landed on its shores in September, 1773. The pioneers aboard the ship were, in turn, the start of a wave of Scottish immigrants that came to define Nova Scotia and influence Canada. * The first principal of McGill University, Sir William Dawson was born and raised in Pictou. 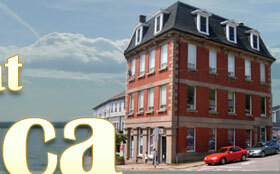 * The high school, Pictou Academy, was founded in 1816 and educated notable scientists, educators and politicians. * The first premier of Nova Scotia, Hiram Blanchard was a Pictou Academy graduate. Visitors to the area should take advantage of some of the many celebrations that take place in town. Some of these include the annual Pictou Lobster Carnival in July, the Hector Festival in August and New Scotland days in September.